Thousands of years before European settlement, the Murray River brought abundance to the many tribes along its banks where the traditions were passed on generation after generation. Existence of Aboriginal occupation of the Murray River starts way back over 40,000 years ago in the World Heritage Willandra Lakes and Mungo National Park north-east of Wentworth and north of Mildura and Balranald. The Mungo region was recongnised in 1981 because of its importance of both geological past and its record of Aboriginal settlement. Today you can take a unique and tour through Mungo National Park with local Paakantyi Aborigial Graham Clarke from Harry Nanya Tours. Graham's ancestors roamed the lands for thousands of years. There are many tribes still in the Murray River region and if you're good, you can spot Aboriginal artifacts such as canoe trees, fish traps and boundary markers. There are other ways to engage with their story and Dreamtime. One such story is the Ngurunderi Dreaming of Ponde the giant cod fish. To Aboriginal Australians the land, sea, sky, moon and stars are part of their spirit, culture and story known as the Dreaming. Each tribe will have their own dreaming story. The Bangerang story told by Auntie Irene Thomas, a Bangerang Elder whose lands are adjacent to the Murray and Goulburn rivers describes how the Murray River was made was by Toonatpan a snake who carved the landscape with his body. European colonisation marked the end of traditional Aboriginal ways, however there are still parts of the Murray River region where you can experience this amazing and wonderful culture. One of the best known Aboriginal artists from the Murray River region was the late Ian Abdulla. His work is both a personal history and a history of his people as he tells the stories of their life on the Murray River in South Australia. See images of Ian's work here. The fundamental of all Aboriginal cultures is respect. Respect for people, land and beliefs. Please do not remove rocks or other objects from Aboriginal land or waters without the permission of traditional owners. Disturbing cultural sites is prohibited by Australian law. Ngaut Ngaut is approximately 45 minutes on the Bowhill Road towards Swan Reach from Mannum. Accessible only by taking a guided tour with the Nganguraku people, the tour provides an insight into a culture older than antiquity, and reveals a magnificent stretch of the Murray River. The tour also visits the birthplace of the Black Duck Dreaming and Australia's first archaelogical dig. But it is only when you put this time scale in relation to our European history that you realise the age of the area. While the 12 year-old-boy searched for mussels along the river edge, the pyramids of Egypt were yet to be constructed. The area of the archeological finds are sacred sites and also important areas of our national heritage, listed on the National Estate Register and are therefore protected. Entry is prohibited. Construction of canoes was seemingly simple but required patience and skill. 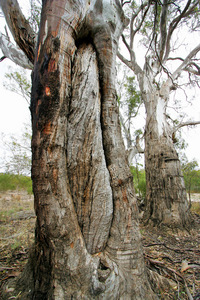 Bark was removed from river red gums only during summer, when the sap ran freely. The required size and shape of the canoe was cut with a digging stick through the bark to the hardwood core. Flat on the ground, small fires were lit on the moist inside of the bark, which evaporated the sap and made the bark curl upwards. The ends were then pulled together and stitched with hemp and plugged with mud. Stretchers were inserted to hold the open shape. After tying it was allowed to mature when it was constantly rubbed with grease and ochre, and had a 2 year life.